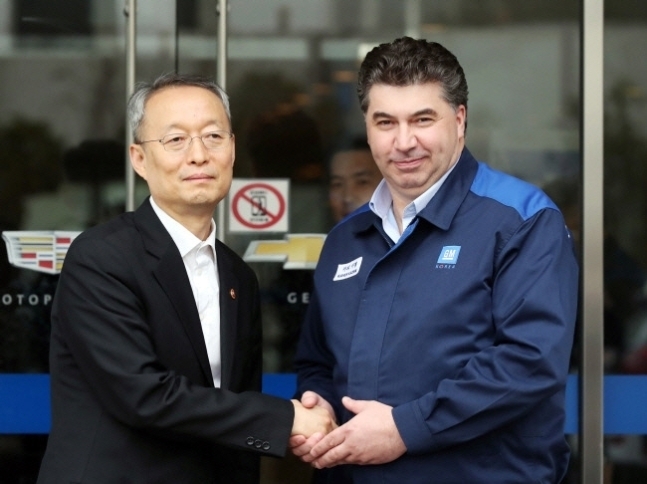 Tension at GM Korea has escalated following state-run Korea Development Bank’s announcement that it filed a preliminary injunction last week against the company’s move to split the research and development center from the local unit as a separate corporate body. In response, GM Korea on Wednesday reaffirmed that the separation would boost efficiency and capacity of workers and management in R&D. It also downplayed the labor union’s claim that GM was laying the groundwork to pull out of Korea by establishing a separate R&D body. GM Korea’s plan to split off the R&D center was brought into the spotlight in July, when it announced a $50 dollar investment plan to increase export and secure new models to be produced here. “A R&D entity would improve work efficiency, as R&D employees work with GM’s Technical Center in Warren (in US state Michigan), by boosting cooperation with headquarters,” a GM Korea spokesperson said. He added that increased work opportunities would also create more jobs. The local R&D center will hire about 100 workers for a new project it was assigned to develop a compact sport utility vehicle. Following GM’s decision to shut down its Gunsan plant in North Jeolla Province, some industry insiders speculated GM would eventually withdraw operation here accept the R&D center that is well reputed for high quality work. The leader of GM Korea’s second-largest shareholder with 17 percent of shares, KDB Chairman Lee Dong-gull said Tuesday it had filed a preliminary injunction last week barring GM Korea from holding a general shareholders meeting for now, as GM has not yet submitted details on the separation. “A new corporate body is not included in the agreement (signed between GM and KDB in May), and I believe could be potentially dangerous. The preliminary injunction was filed because GM Korea has not yet responded to requests for details,” Lee said during press conference to mark the first year of his inauguration in Seoul on Tuesday. KDB can exercise its veto power over important issues, such as GM’s moves to sell its assets here. If GM’s plans go through, the design center, technical research center and divisions on power trains, among other issues, would be included in the new corporate body, which is expected to focus on creating GM products for the global market.